The Wimbledon Championships are well under way, and Andy Murrays chances of capturing a maiden Grand Slam are looking better by the day. If you want to keep in touch with all the happenings in SW19, or you fancy a bit of tennis yourself, we've got five great tennis apps to keep you entertained. 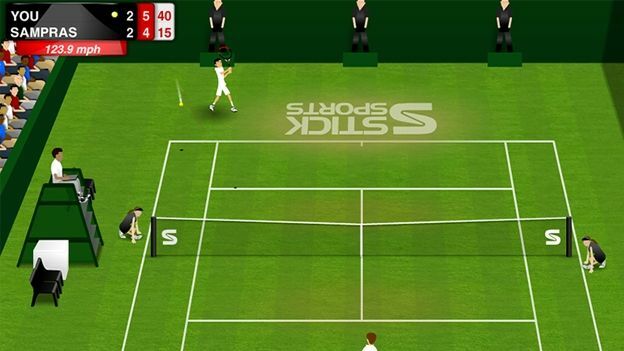 A follow up to the phenomenally popular Stick Cricket, the Tennis flavour pits you against some of the greatest players of all time. Like it's cricketing counterpart, it's easy to pick-up but extremely difficult to master, and serves up 6 separate game modes as well as a good choice of characters and courts. The official Wimbledon app for iPhone. Not only do you get live scores and results, as well as schedules, but the app provides live radio coverage of the Championships as well as interviews, highlights and player profiles. For those serious tennisistas amongst you, this app is a professional statistics gathering tool that claims to help you improve your game. The idea is that over time, your statistics will reveal your strengths and weaknesses, making this the ideal app for serious tennis players and coaches alike. Soak up the sounds of SW19 with all the key umpire calls featured in this soundboard app. You'll also get the best McEnroe classics, and if you're a grunting fan, Federer, Murray and Sharapova's best efforts are among those included as well. Sega's superb Virtua Tennis series finally makes it's way onto mobile devices! Compete against 50 players in anything from single exhibition matches to full Grand Slam tournaments, but be warned - just hitting the ball won't get you anywhere. You'll have to adapt your game to the surface, and to your opponent to stand a chance of winning.